Few months ago i was wrote a post create virtual drive direct access the desired folders with Visual subst,now we have a alternative way with folder guide software direct access desire file folder with maximum 2 mouse click. 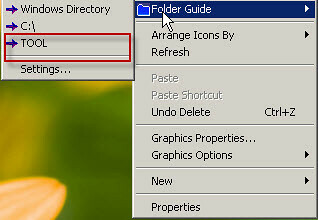 Folder Guide is a handy shell extension that allows you to quickly access a list of your favorite folders from the Explorer right-click menu. You can easily switch to a folder from within Windows Explorer, the Open/Save dialogs of applications, or directly from your desktop or the Start button. New folders can simply be added to the list via the right-click menu, or from the Settings dialog. Folder Guide also includes an option to launch folders in Explore mode when they are opened directly from your desktop or Start button right-click menu. 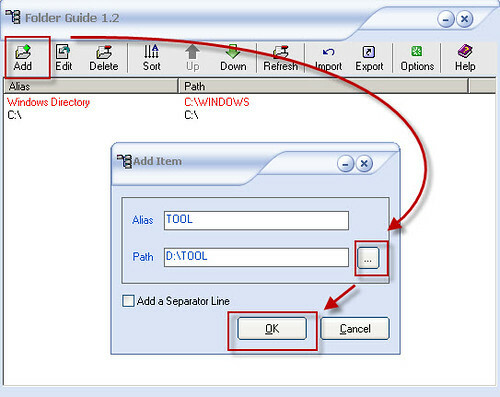 Added a desired folder in right click menu is simply and easy.Download Folder Guide 1.2 ( 769kb ) and installed.Double click folder guide program and will pop up a window ,then click ‘Add’ ,browse to the folder that you desired and click ‘OK’ . In your right click menu added a folder that you choose. I used this software for few days and found that it is quite convenient for those create multiple folder in computer , just added in frequently used and favorite folders ,then can direct access from your right click menu without open up window explorer. This program supports Windows 9x/Me/NT/2000/XP/2003 .